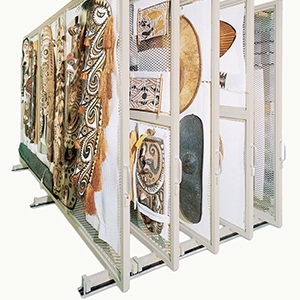 Viking by Spacesaver offers a wide range of configurable museum cabinets to meet a variety of needs. 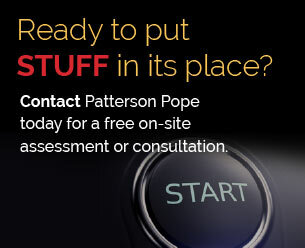 At Patterson Pope, we understand that no collection is standard. 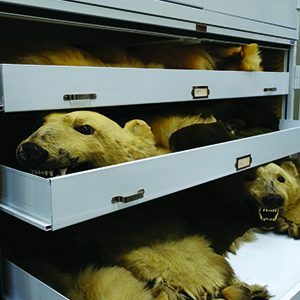 That’s why we’re proud to offer a complete range of customizable museum storage solutions, including high-quality museum storage cabinets from Viking by Spacesaver. 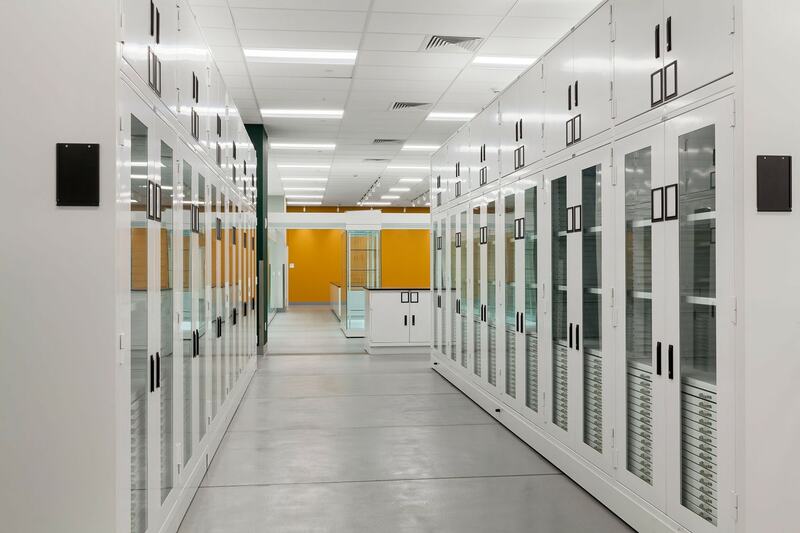 Made in the USA of heavy-duty steel, these carefully crafted cabinets offer complete configurability, allowing you to design a storage solution that’s based on the needs of your collection, your staff, and your facility. 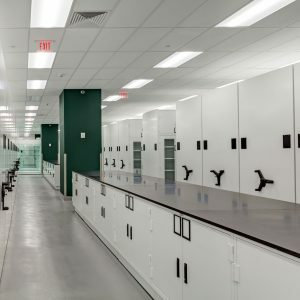 Designed to protect items from dust, water, and damage, Viking metal cabinets have been chosen for the Smithsonian, the Field Museum, Yale University, and other institutions large and small. The industry-leading Viking Watershield™ cap helps ensure that water from sprinkler systems, ruptured plumbing, or leaky roofs will not penetrate the cabinet, and our closed-cell Elastomeric Seal™ has been verified by a third party to exceed stringent air exchange standards. This Museum Cabinets brochure is a good way to “do your homework”. It should provide all the information you need to get your project started. Download it now. 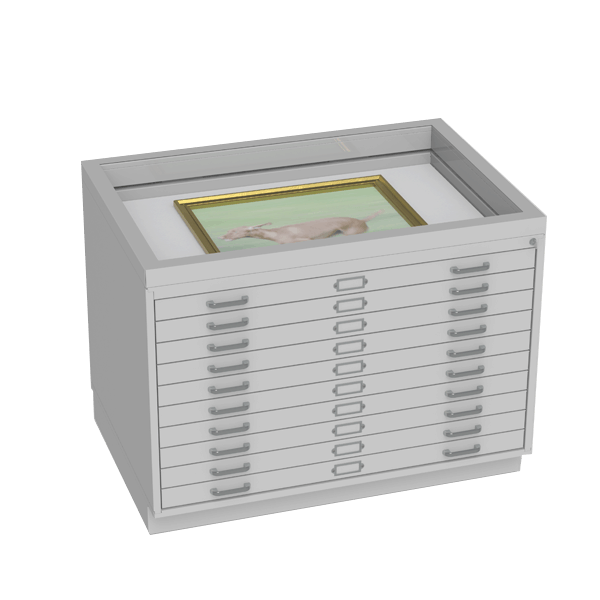 And since a museum’s storage space can seem almost as precious as its collections, our cabinets can easily be mounted on compact mobile carriage-and-rail systems to make the most efficient use of available space. Spacesaver’s “compactors,” as they’re affectionately known, eliminate wasted aisle space while maintaining complete accessibility. A few turns of a mechanical-assist handle or the push of a button can move thousands of pounds with minimal effort. 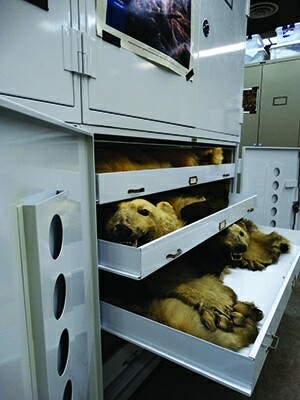 Here’s a quick overview of the Viking by Spacesaver line of museum cabinets. Please contact us to learn more and to start discussing how to make the best use of your space. 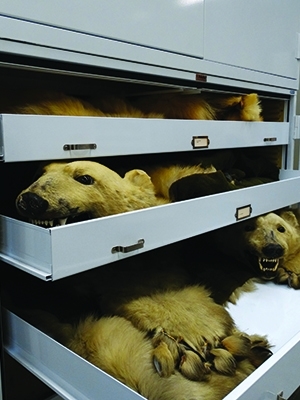 Available in counter height and full height, conservation storage cabinets are our most popular museum cabinets. 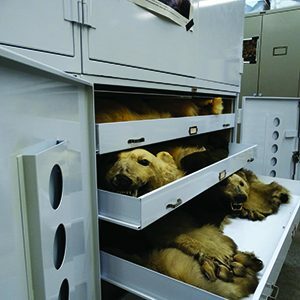 They can be configured to store a wide variety of specimens and artifacts. 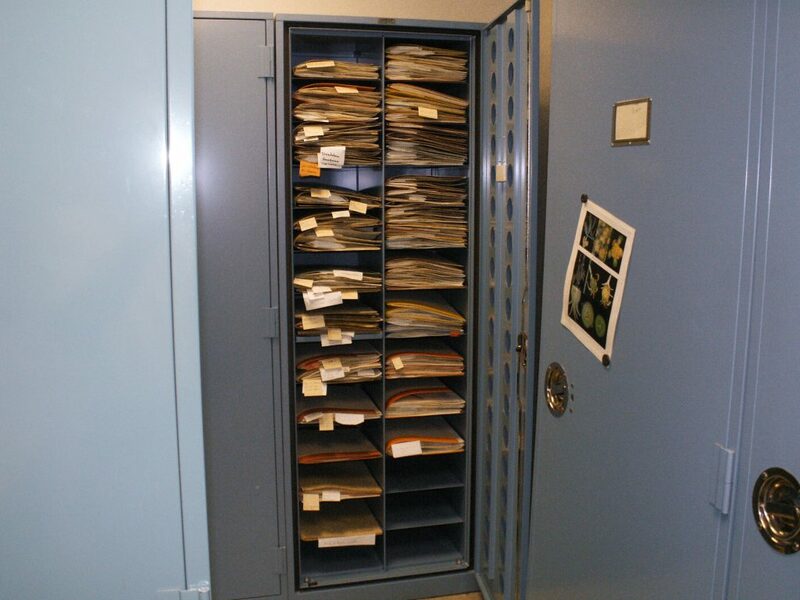 These carefully crafted cabinets are ideal for heavy geological collections. Available in counter height and full height designs, the cabinets can be equipped with heavy-gauge steel drawers from any supplier. 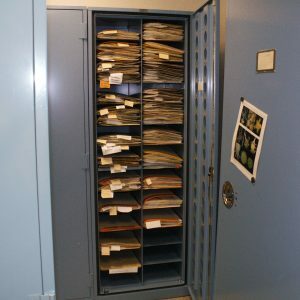 Perfect for herbaria, these botany cabinets preserve botanical specimens and protect them from infestation. 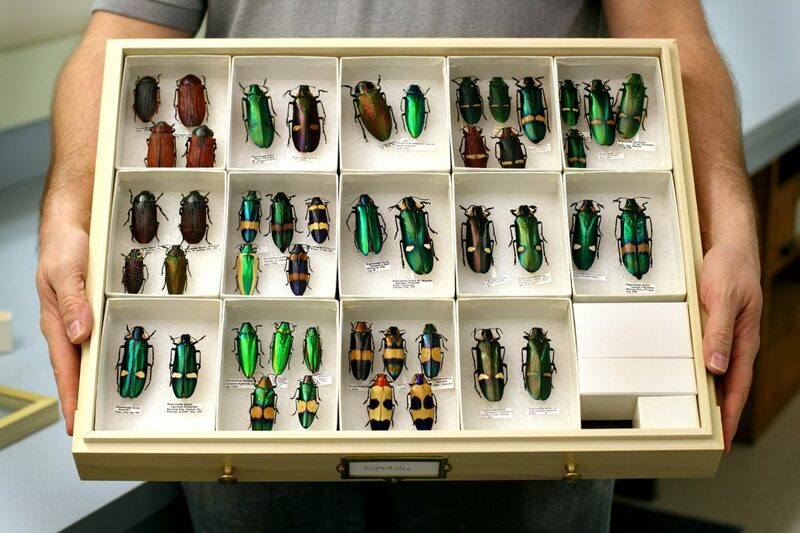 The full height models feature a convenient reference shelf for viewing specimens in the collection storage area. 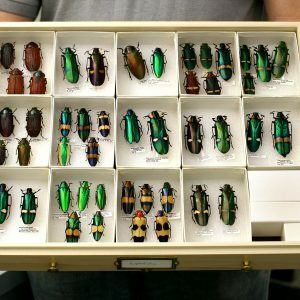 Accommodating four styles of entomology drawers – Cornell, USNM, California Academy and Smithsonian – these entomology cabinets meet and exceed professional standards. 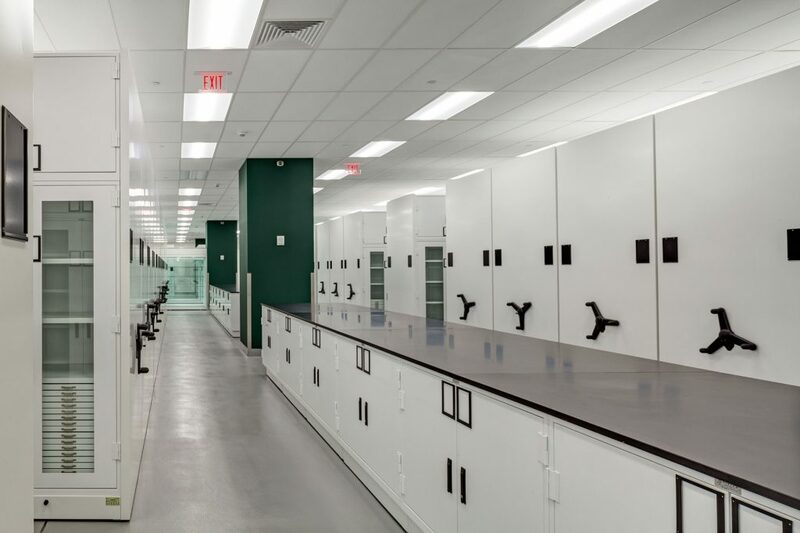 Pull-out work shelves are included on full height models to provide extra workspace, and you can choose from enclosed cabinets or open shelving to best suit the needs of your collections. 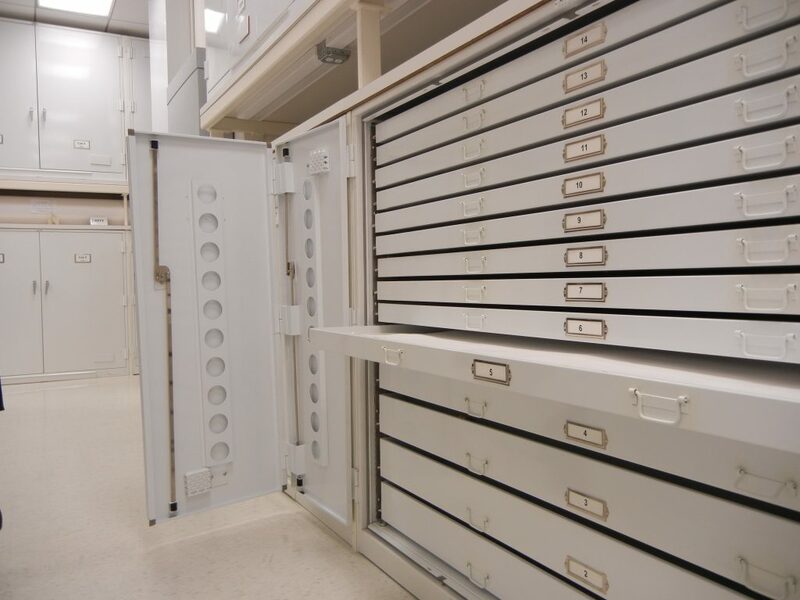 Capable of storing a number of large flat items, these cabinets have stainless steel tracks and plated rollers that eliminate contamination from flaking paint. If equipped with the optional base, they can be double-stacked to create a counter-height work or storage surface. 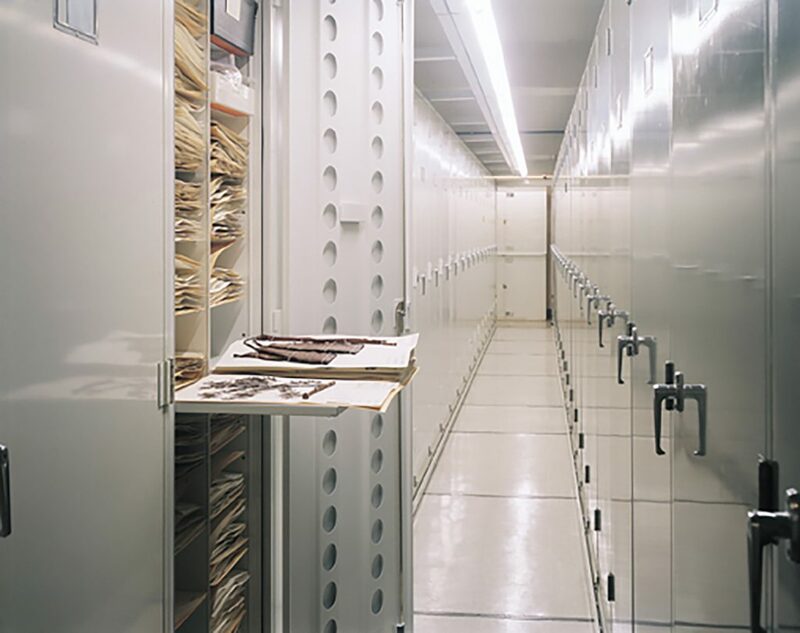 Spacesaver’s in-house engineering team routinely works with Patterson Pope’s clients to create custom solutions that are ideally suited for the unique needs of particular collections. 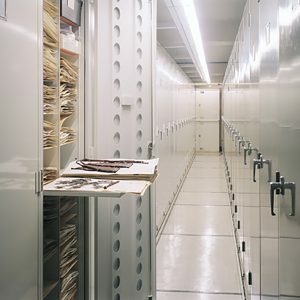 Protect your collections and make the most of your space with high-quality cabinets from Spacesaver. 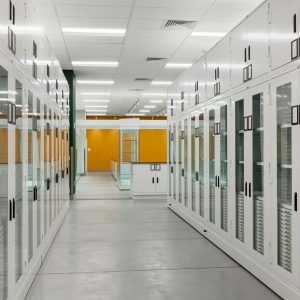 Made in the USA, our sturdy cabinets are built to last and can be fully customized to suit the unique needs of your collection, your staff, and your facility. 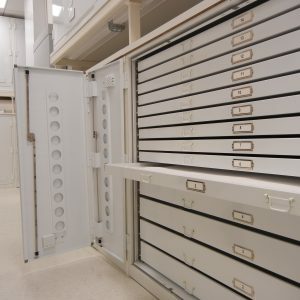 Just as important as the design and construction of our cabinets is the service that comes with them. Patterson Pope offers space planning services as well as long-term service and maintenance to ensure the long-term performance of your storage system.